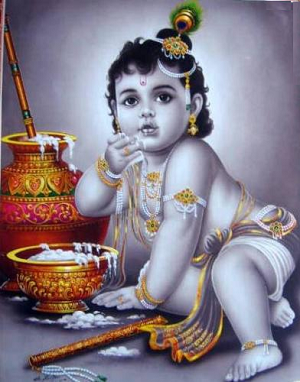 Today is Janmashtami, the birthday of Lord Krishna, a very auspicious day in Indian calendar. At the zero hours of this day nobody can, for sure, say when he was born to mother Devaki and father Vasudev in the prison of the cruel demon king Kansa of Mathura. Since Kansa was determined to kill every child of Devaki not to be eliminated by any of them to remain immortal, Krishna was taken for safety to the neighbouring kingdom Brindavan of king Nanda. There queen Yashoda brought him up with great love and affection. It is here in Brindavan that through his pranks and mischief the philosophy of love, affection, devotion, friendship, divine order of Krishna came to fore to guide and give directions to generations in this country. The concept of religion can be intellectual open to debate, or emotional and devotional to be accepted unconditionally. One can see god through love as Radha did, or remaining at his mercy as Sudama, Arjuna, the elephant and Draupadi in distress or at an intellectual level as Udhav. The sages and seers endeavor though devotion and penance. Lord Krishna is special, he is a god of the poor. He is a friend of the friendless, a father to the orphan and a child to the childless. The very name of Krishna brings tears in one’s eye, one desperately searches for words and others forget place and time. Let say our prayers to this benevolent god on his birthday: Om bhagavate Vasudevay namoh! !